I just wanted to point out to everyone that most fish in the wild spawn during heavy cloudy and rainy days. 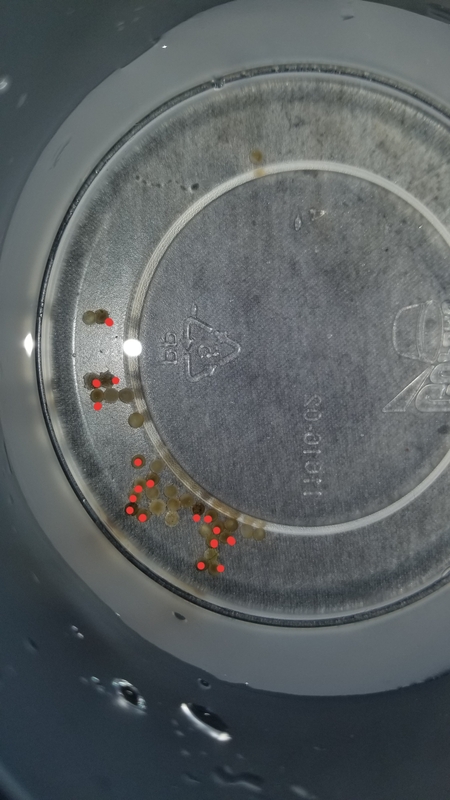 @kberg2498 said his corydora duplicareus have already started spawning with no help what so ever. So, if your have some fish that you are trying to breed or have had trouble getting to spawn in that past, USE THE RAIN! Do a small water change today using slightly colder water than what is in the tank, mimic the influx of freshwater into rivers and lakes caused by the rain, you might be pleasantly surprised! I also suggest putting together a rain barrel as well for anyone trying to breed or get better results. I have a 110 rain barrel I set in the middle of the yard with a huge diy funnel. I use that water for plant only tanks, shrimp tanks once in a while, and breeding tanks! I like the idea bigtime! As I live in dirty ole LA County is there concern for pollutants? I would love some baby apistos!!! yeah I got around 15-20 good eggs so far 3 of them were from the batch a few days ago and they hatched in this container like a minute after I took the photo. Having a hard time picking out the eggs from the giant storm of xmas moss I got from amzreefs lol. But I think you’re on to something... my Apistogramma baenschi females are all bright yellow and black....oh, and mean! Had eggs a few days ago, but lost em..
those in the cities. make sure to let the rain, rain for awhile before u collect. LA air is dirty let it rain for a while till it cleanse everything then collect. Hey guys, I messed up this thread... Kole wasn’t advocating collecting rain water... he was explaining that this weather is associated with breeding behavior with certain fish... and to utilize this weather to conduct water changes (with normal water sources, not rain water).. Yes Mike, its cool though lol. I wouldn't advise anyone to collect rain in so cal. Theres who knows how many amounts of chemicals in out rain water due to the smog here. Its something about the pressure in the atmosphere the fish can sense and it puts them in the behavior, so a little extra kick with a watet change to mimic the fresh rainfall can be just the push they need to get it on. I'd be interested in seeing what effects if any mimicking the sounds, lighting and surface splashing/vibration of rainfall might have in triggering similar behavior. Fish are sensitive to these as well, and since they are hardwired to recognize changes that signal 'breeding time' some of these other signals might have an effect. Supposedly the "storm" or "lightning" effects of modern LED lighting systems will trigger some mating responses in fish. I do have a rain-inspired scape in my daydreams that eventually I will fabricate. Not in order to encourage breeding, but it will be interesting to see what might occur as a result. It's on my 'dream list' as well if funds and space considerations ever allow. Yeah. I guess if anyone has an RO setup they could use that to auto replace evap since this water shouldn't clog the holes with mineral buildup or biofilm crap if you are using recirculated water.